Coconut Beach was a fragrance I truly couldn’t resist purchasing the moment I saw it listed on Yankee’s website. 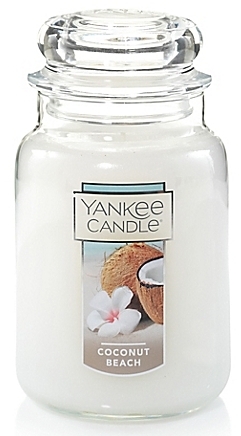 I love coconut scents, especially sweet and sugary ones… add a tropical component and I’m sold! This candle sounded amazing. First impression… this was an interesting coconut fragrance for me. It wasn’t a sweet tropical coconut but more of an airy and fresh floral. I admit I was hoping for more coconut in this scent but that’s okay… Coconut Beach was so pretty, it was already growing on me and I hadn’t even lit the wick yet. Now let’s see how this candle performs! I stuck to a small bathroom to burn this candle in. Yankee candles are generally lightly scented for me so smaller rooms work best. Once the wick was lit, it took a good 4 hours to reach a full melt pool and from then on out… a very fresh and bright floral filled my bathroom. Coconut may have been present but whatever floral I was smelling dominated over the coconut. I’m guessing it was the Tahitian vanilla and Lei blossom. I never detected pineapple or musk in this aroma. Very strange and yet still such a pretty fragrance. I liked it. It just wasn’t what I was expecting. Strength – this was a light fragrance as predicted. In a small room, I would rate this candle a 6 out of 10. Not super strong at all. I wouldn’t even try in a medium or larger room. The scent would be totally lost. This candle burned fine, minimal wick trimming too which surprised me. Coconut Beach was a surprise scent for me. I went into this review thinking one thing and ended with a completely different perspective and opinion. I thought it would be a sweet tropical coconut but it ended up being a soft tropical floral instead. At least that’s what my nose picked up on. Regardless of what I expected, it was still a lovely aroma and I’m not a fan of floral scents. My husband didn’t mind it either. I had this candle burning two solid weeks and he never once said a word. I consider that a win. In closing, if you’re thinking of purchasing this scent because it has coconut in it, I suggest you swing by a Walmart Supercenter or a Yankee store and smell it first before purchasing one. You may or may not like it. Floral lovers… this was a lovely scent worth a gander.